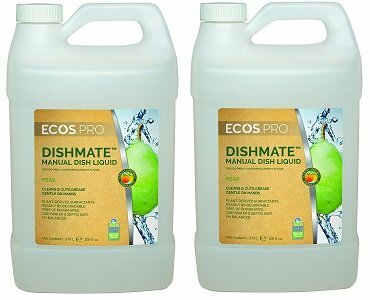 The Earth Friendly Products Proline PL9720/04 Dishmate pear ultra-concentrated liquid dishwashing cleaner is a pear-scented phosphate-free liquid detergent for manual washing of dishes, silverware, glassware, cooking utensils, and related items, and is made with biodegradable, plant-based active ingredients using a pH-balanced formula that reduces the risk of damage to surfaces. It comes in a one-gallon plastic bottle for efficient storage when filling a dispenser (sold separately). This product is safe for greywater and septic systems.